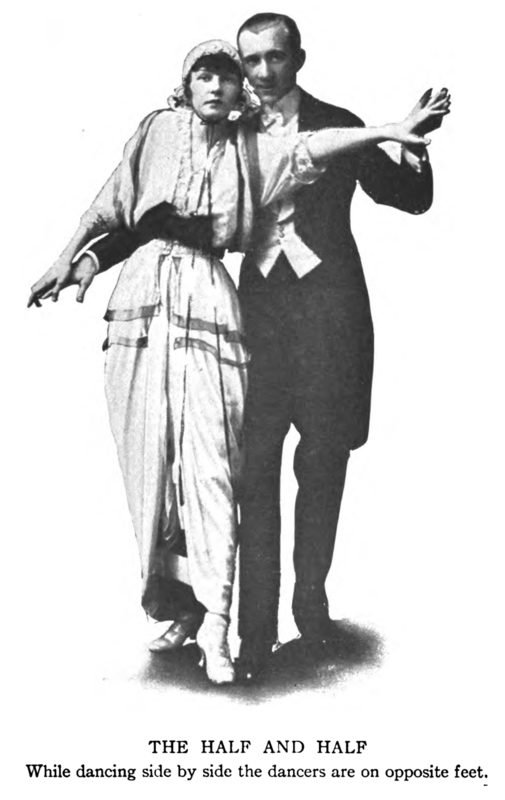 The Half and Half is a dance in 5/4 time invented by Vernon and Irene Castle and introduced in 1914. 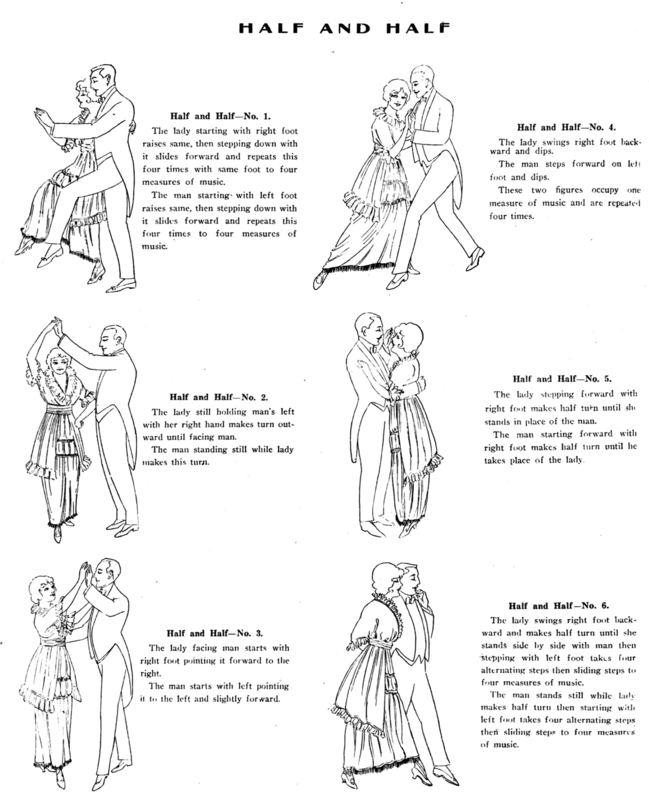 It is a form of Hesitation Waltz with five beats instead of six. Basic: Back the Follow one long, slow step (1), and two short, quick steps (4, 5). Then repeat on the other foot (1, 4, 5) [VC14, FC14, JS14, JM15]. Can also be done backing the Lead [FC14]. Promenade: Same as the Basic, but in promenade position, both traveling forward along LOD [FC14]. Can also be done in Open Position [FC14, JM15]. Dipping Promenade: Same as as the Promenade, but dipping on the slow step forward [FC14]. Lifting Promenade: Same as as the Promenade, but lifting the free foot forward on the slow step forward [FC14]. Dip and Lift: One measure of Dipping Promenade followed by one measure of Lifting Promenade [FC14]. Hopping Promenade: Same as the Promenade, but hopping on count two, raising the free foot slightly behind [FC14]. Hopping Promenade with Alternating Lift: Same as the Hopping Promenade, but raising the free foot slightly in front the first time, then behind the second time [FC14]. 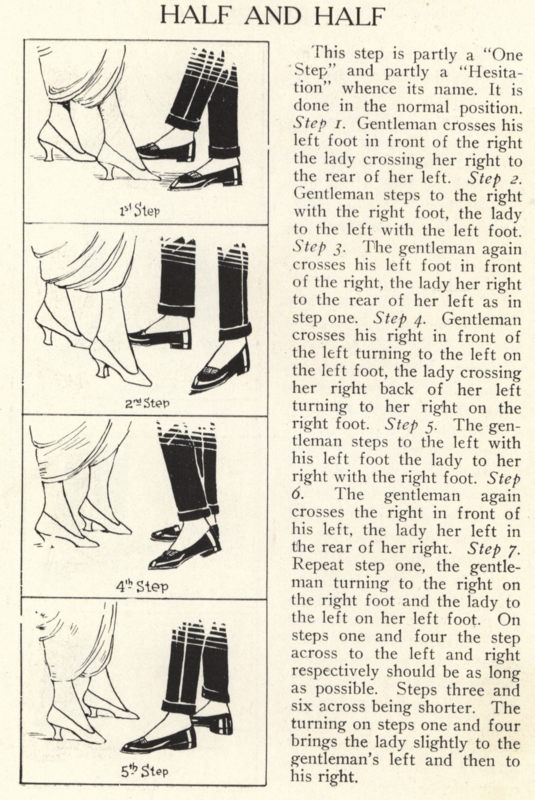 Box Step: Forward (1), side (4), close (5), then repeat on the other foot (1, 4, 5) [FN14]. Turning Box: The box step can also be turned to the right or the left (to the right starting on the right foot, or to the left starting on the left foot) [FC14, FN14]. 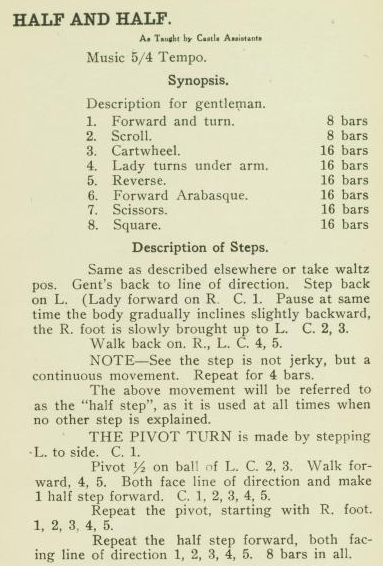 Pivot Turn: Spin (pivot) halfway around on the slow step (1), then promenade two steps along LOD (4, 5). 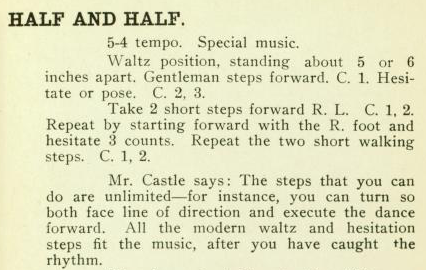 Lead backing around with left foot the first time, then Follow backing around with left foot the second time [VC14, FC14, JM15]. This can also be done turning to the left, with Follow backing around with right foot the first time, then Lead backing around with right foot the second time [FC14]. 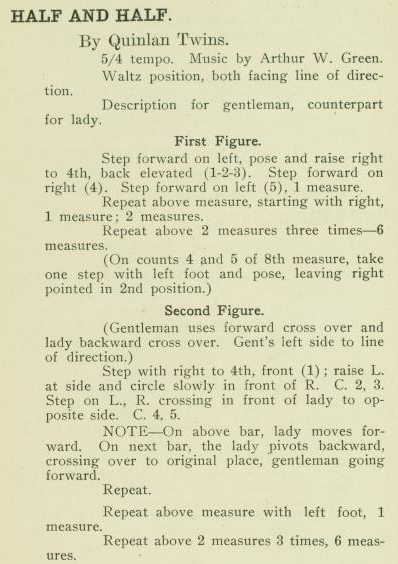 Underarm Turn: The Lead promenades forward twice, as the Follow promenades forward once, then backs under the leading arms with a right pivot turn, starting back left foot [FC14, MF14]. The Scroll: Promenade once along LOD (1, 4, 5). 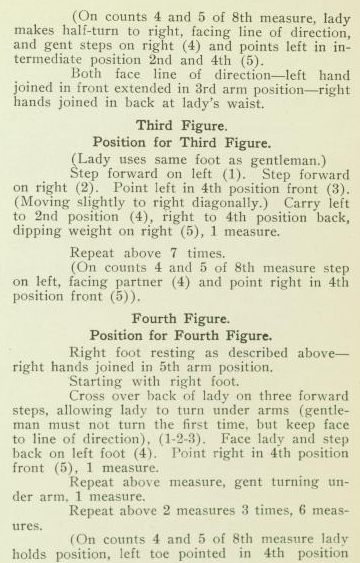 Then the Lead continues to promenade forward as the Follow pivots halfway to the left to get right hip to right hip (1), then takes two steps back (4, 5). In this position, back the Follow three steps (1, 4, 5). 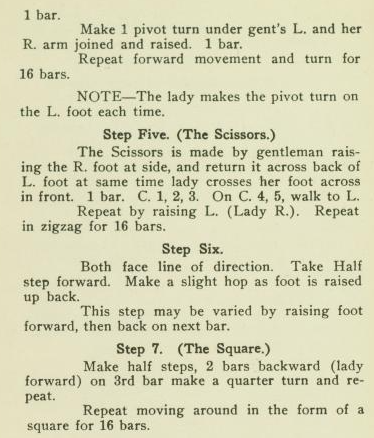 Then both pivot halfway to the right (1), and back the Lead two steps (4, 5), followed by another three steps (1, 4, 5). Repeat by both pivoting halfway to the left and backing the Follow, etc. [FC14]. The Square: Back the Lead three basics, turning 90° to the right on the third, and repeat three times to complete the square [FC14]. Eight Step: Promenade three steps (1, 4, 5), turning 90° to the right on the third step, then repeat three times, tracing out a square on the floor [VC14]. Scissors: Lead crosses left in front (1), steps side right (4), and crosses left in front (5), then crosses right in front (1), steps side left (4), and crosses right in front (5). The Follow crosses behind as the Lead crosses in front [CB14]. Can also start on the right foot, or cross the Lead behind as the Follow crosses in front [FC14]. As a more comfortable adaptation: start on the third (or sixth) step, so you have three counts to sweep around from one cross to the following cross, instead of just one. 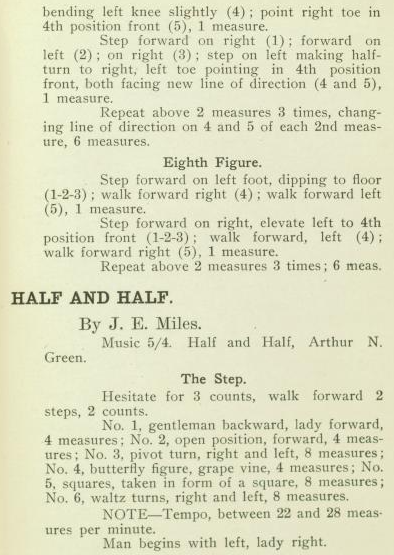 Three-Step Promenade: Promenade three steps to Lead's left (1, 4, 5), then three steps to Lead's right (1, 4, 5) [JM15]. Back Ochos: Cross second foot in front of first (1), then sweep first foot around to cross it in front of second (4). The Follow crosses behind each time [FC14]. 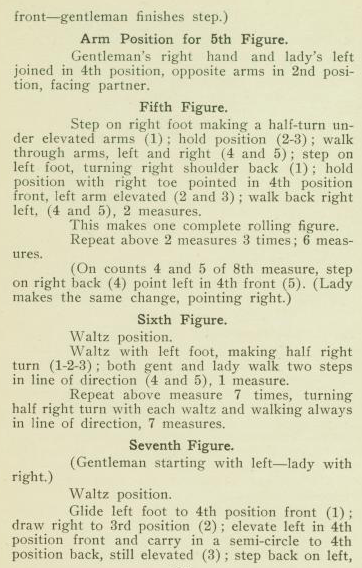 To get into it, do an odd number of Promenades, or do an even number of Promenades, taking only two steps on the last one, holding the second foot out to the side for count 5. It can also be done starting on the left foot [FC14]. Grapevine: A grapevine in 1, 4, 5 timing. Side (1), cross (4), side (5), cross (1), side (4), cross (5) [FC14]. 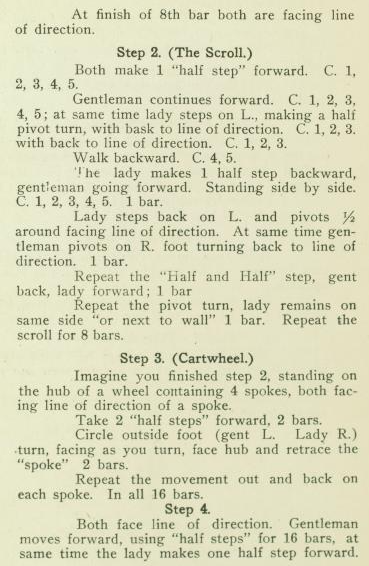 Five-Step Waltz for 1914: Half of a right-turning waltz starting with Lead backing (1, 2, 3), then promenade two steps over elbows along LOD (4, 5). Repeat opposite (1, 2, 3, 4, 5) [FC14]. 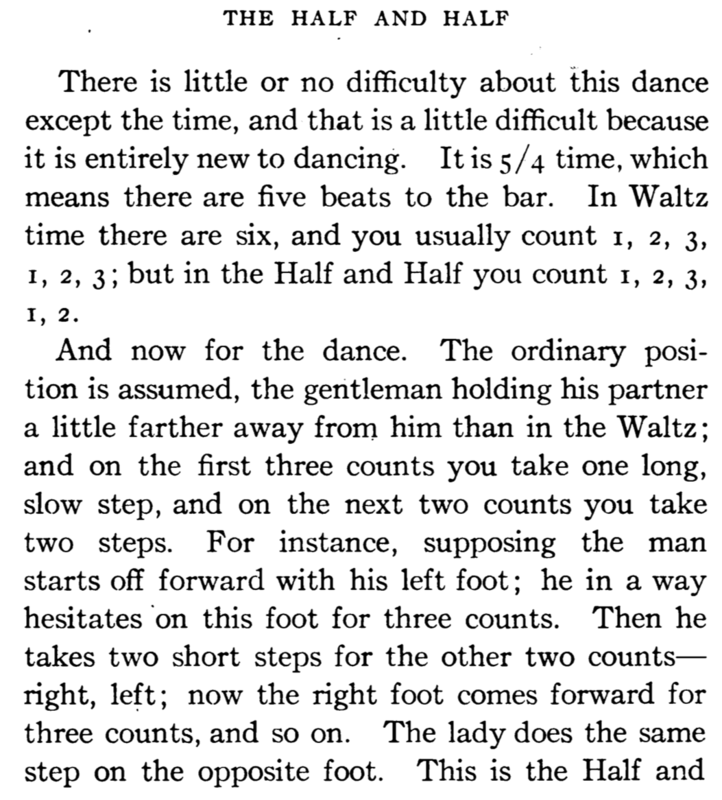 One and Seven: An adaptation of an early Fox Trot step to 5/4: one long, slow steps (1), then seven short, quick steps (4, 5, 1, 2, 3, 4, 5). It's also suggested, without further explanation, that you can run eight steps to the seven counts, in order to hesitate on the other foot. 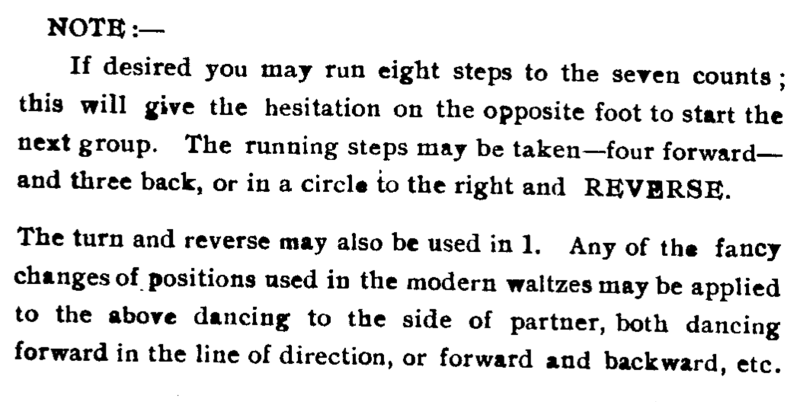 The running steps can be taken "four forward and three back, or in a circle to the right and reverse" [FN14]. Changing Position: Several sources note that the Half and Half can be danced in a variety of positions, including waltz position, promenade position, and side by side (as illustrated above) [VC14, MF14, FN14]. Music in 5/4 time [VC14, FC14, MF14, FN14, JS14, JM15]. For a list of early 20th century pieces for the Half and Half with free downloads of the sheet music, see Half and Half Music. 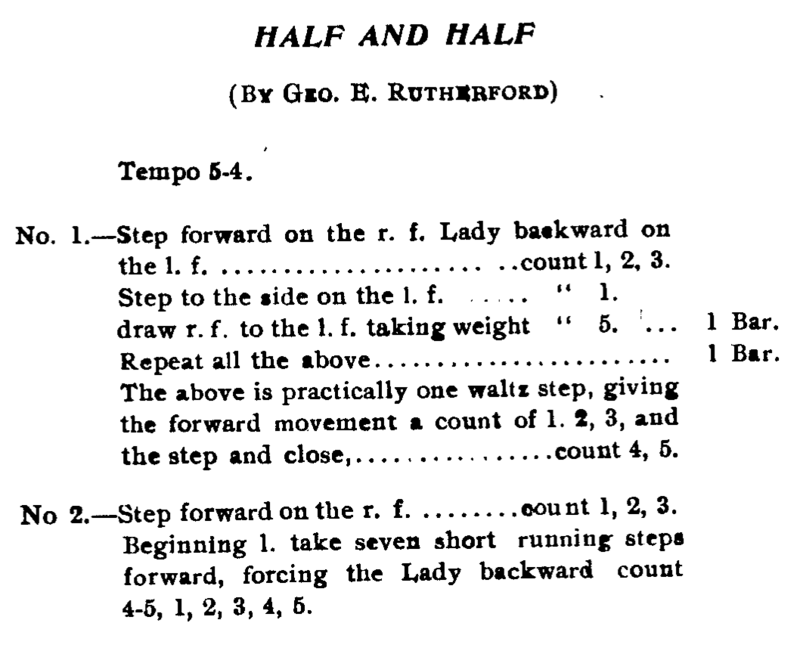 A wide range of tempos was proposed for the Half and Half. One recording from the time is at 174 bpm. Another is at 132 bpm. A piece of sheet music for the Half and Half specifies 160 bpm. A written source cites a tempo range of 110 to 140 bpm [FC14]. Some variations work better at certain tempos than others. CB14 — C. F. Burgess, Virtus R. Scott. (1914). 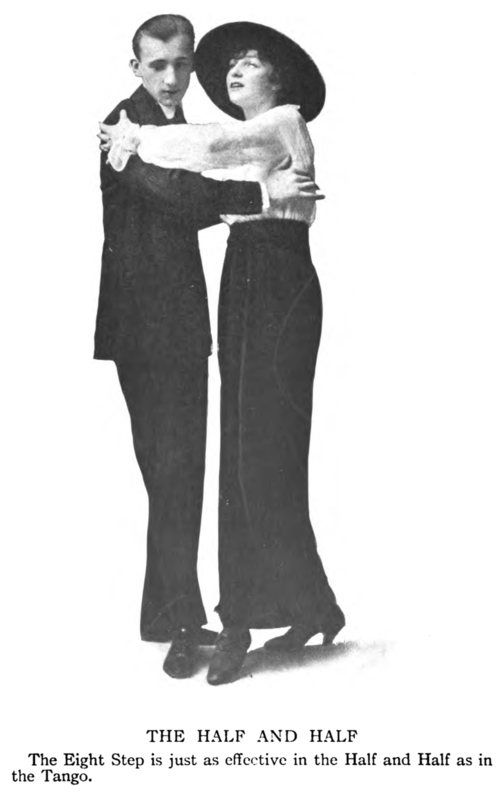 King's Booklet on Dancing. New York. VC14 — Mr. and Mrs. Vernon Castle. (1914). Modern Dancing. New York. FC14 — F. Leslie Clendenen. (1914). 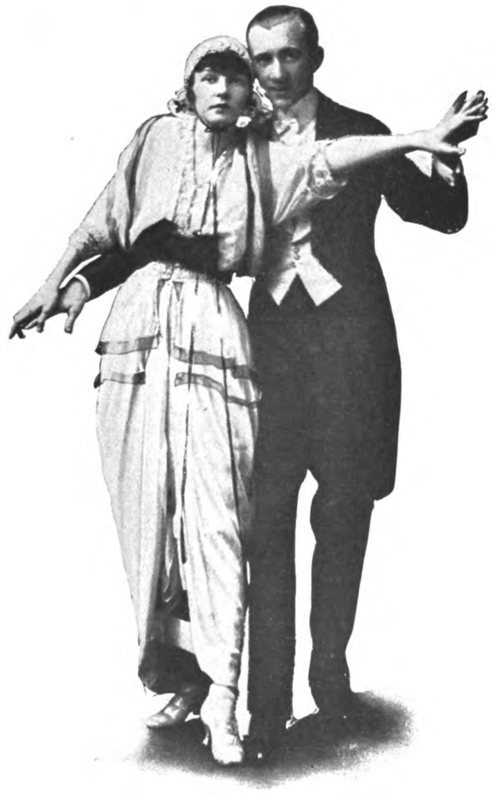 Dance Mad, or The Dances of the Day [Late 1914 Edition]. St. Louis. MF14 — Malvin M. Franklin. (1914). Modern Dances, Society's Latest Dance Folio, No. 1. New York. FN14 — Frank H. Norman, Sr. (1914). Complete Dance Instructor. Montreal. JS14 — Jos. W. Stern & Co. (pub.). (1914). Castle Society Dance Folio No. 2. New York. JM15 — John Murray-Anderson. 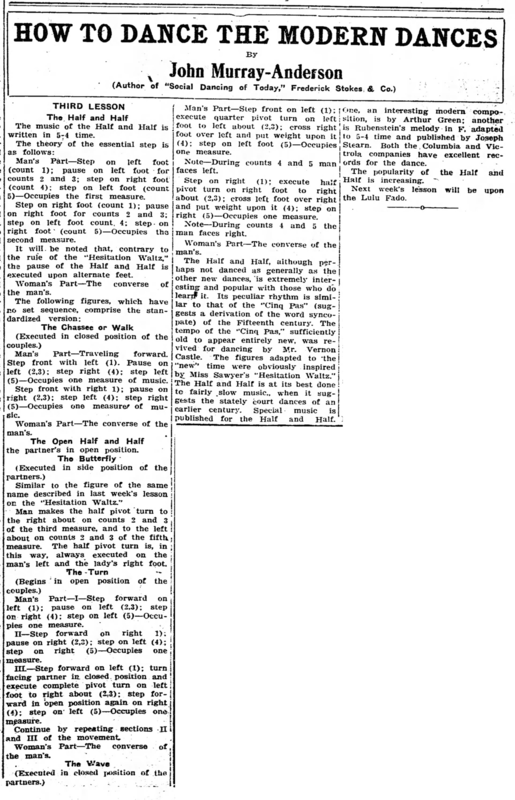 (1915, January 17). 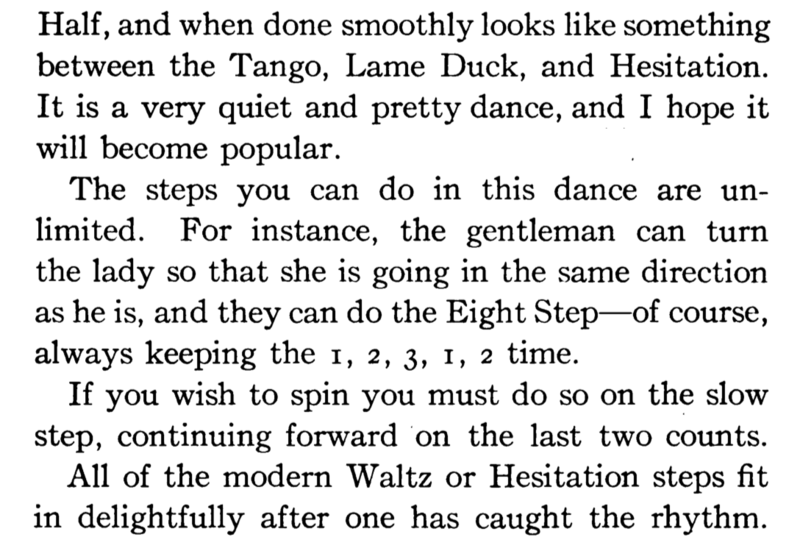 "How to Dance the Modern Dances, Third Lesson, The Half and Half." The Arizona Republican (Phoenix, AZ).